School Board Elections: April 2! Login to NUEA Connect to see NUEA recommended school board candidates. Interested members of NUEA should submit candidate statements before February 12. Login to NUEA Connect to see how. We are educators, parents, and community members. We are deeply committed to ensuring every student has the opportunity to succeed regardless of ZIP code. Together, we will advocate for the resources students need to succeed, including up-to-date textbooks, desks and chairs that aren’t broken, the latest technology, and adequate school buildings. Take the #RedForEd Pledge. Add your name to show your support for great public schools. Three students from the Naperville area received scholarships from the Naperville Unit Education Association (NUEA) in the amount of $1500 each. The NUEA annually gives three scholarships to high school seniors who are children of NUEA members. Scholarships are awarded based on extracurricular participation and contributions to the community. These scholarships were awarded in May, 2018. The scholarship recipients are Edward Forsythe from Metea Valley High School, Esther Park from Naperville Central High School, and Anna Southon from Naperville Central High School. The NUEA scholarships were created by certified staff in District 203 through their union to recognize outstanding contributions among area high school seniors. The scholarships are funded by member dues and represent a small portion of the local support NUEA provides the community through scholarships, volunteerism, and charitable giving. Edward Forsythe – Edward Forsythe will be attending the University of Iowa this fall as a marketing major within the Tippie College of Business. While at Metea Valley High School, Edward enrolled in a schedule packed with Advanced Placement and honors courses, including AP history, AP psychology, and Honors English. His demanding workload was supplemented by an equally demanding athletic regimen. Edward played soccer for two years and volleyball for four years at Metea. He also played club volleyball and participated on the Student Athlete Leadership Team and Principal’s Advisory Board. Outside of school, Edward was a valuable contributor to his community. He participated in the St. Thomas Religious Education program until his sophomore year, when he transitioned into the St. Thomas Retreat Team for the next three years. He also was employed as a lifeguard and swim coach while volunteering for the Metea Valley Healing Field Construction team and Feed My Starving Children. Esther Park – Esther Park will be attending Calvin College in Grand Rapids, Michigan, where she will major in biology. Esther has been active at Naperville Central High School as a musician, athlete, volunteer, and academic. As an avid cello and piano player, Esther attributes her academic persistence to her musical experience, stating, “Music has trained me with the resilience necessary for achievement.” Her resilience has manifested itself in four years of Bella Corda, and two years in the Tri-M Music Honorary and the Cello Choir. Esther has also participated in Cross Country and Track for three years. She has volunteered for several health-related events and organizations, citing inspiration from her dentist, a volunteer who has practiced in high-poverty areas such as Addis Ababa, Ethiopia. She holds several part-time jobs, including nannying and delivering private music lessons. All the while, Esther is a member of the National Honors Society. Anna Southon – This fall, Anna Southon will be attending the University of Michigan with a major in political science. Anna’s extra-curricular activities at Naperville Central High School reflect a strong desire to make her school a welcoming and nurturing environment. Anna was elected as a Class Council Member for three years, and she participated in the NCHS Community Leadership Workshop, the Red Rage Spirit Club, and a LINK crew member, which helps facilitate a smooth transition for incoming 8th graders into high school. Notably, Anna was a Sensory PE Peer Mentor, working closely to help a student with autism assimilate within the school environment. Anna balanced academics with athletics with skill. On one hand, she was a member of the Spanish Honor Society, National Honor Society, a National Merit Finalist, and an Illinois State Scholar. On the other hand, she played soccer as a Freshman and she was a member of the Cross Country and Track teams for all four years of high school. She was also a volunteer camp counselor for the Girl Scouts at Camp Greenewood in Lisle and she was a soccer referee for the Naperville Park District. She completed both activities during all four years of her high school career. 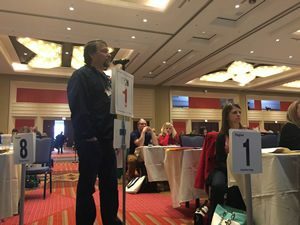 NUEA Represented D203 certified staff at the 2018 IEA RA from April 19-21. The RA included appearances from MSDHS Survivor Mei-Ling Ho-Shing, State Treasurer Mike Frerichs, Comptroller Susana Mendoza, Secretary of State Jessie White, and Gubernatorial Candidate JB Pritzker. Rob Hunt (LJHS) speaks to the delegation regarding a pending bill. 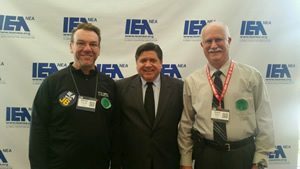 Dave Carroll (MJHS/Maplebrook) and Mark Bailey (President, NUEA) stand with JB Pritzker. The hall is packed with delegates from all 70 regions within the IEA. Naperville is represented by Region 39. 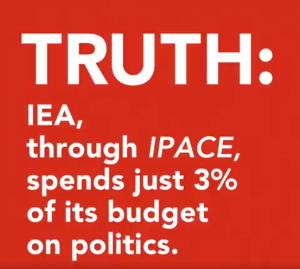 Ed was a tireless advocate for Naperville teachers and students, serving in the NUEA and the IEA for many years. He was mayor of Bolingbrook from 1981 to 1985, and he was a science teacher at Naperville North High School. He also coached the NNHS girl’s golf team and was inducted into the Illinois Coaches Association Golf Hall of Fame in 1995. Ed wa s an integral part of the NUEA, serving on the negotiating team for several contracts. Ed was always fair and never accepted less than anyone’s best effort. He was quick to celebrate the successes in life. He helped lay the foundation for the benefits and working conditions that Naperville teachers currently enjoy. We are forever indebted to Ed for his vision and his tenacity on our behalf. Thank you, Ed. 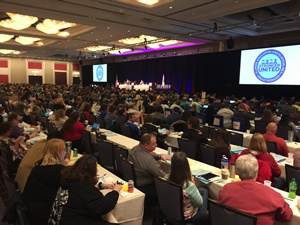 NUEA works hard to ensure that every child in District 203 gets a high quality education by supporting certified staff members, students, and community members in Naperville. NUEA is a supporter of the Naperville Education Foundation and other charitable organizations that strengthen our community. NUEA also offers three scholarships in the spring to help better prepare students for the financial needs of college life. We are also actively pursuing the implementation of an innovative professional development model that will keep our teachers on the cutting edge of best-practice research. Many of our 1200+ members live, shop, dine, and play in Naperville, Bolingbrook, and Lisle, and we have a vested interest in helping our community to thrive. If you would like to partner with the NUEA on a business or service initiative, please contact President Mark Bailey. NUEA Connect NUEA Connect is the members' only portion of our site. NUEA Connect is the members' only portion of our site.